Fluoride is a natural mineral that has been long known for its benefits to a person’s dental health. It can be found in water and soil, in some food and beverages and in some dental care products such as toothpastes, mouth rinses, etc. It increases the protection of your teeth against cavities and repairs decay in very early stages. It repairs the outermost portion of the tooth, the enamel, by promoting the restoration of minerals like calcium back into your teeth, which is vital in the repair of an early cavity before it begins to form a hole into your tooth. 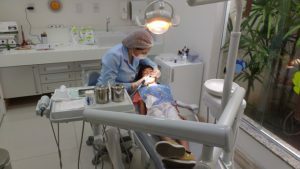 At the office of Orthodontics and Dentistry for Kids, we offer topical fluoride application treatments wherein a professional strength fluoride varnish is applied directly to the teeth and left on for some time. The solution is then washed off, and patients are requested to avoid rinsing their mouth for at least an hour to allow the teeth to absorb properly. Fluoride is ideal for patients with spots on their teeth because these spots are an indication of the deficiency with minerals and fluoride. To make the spots disappear, the right amount of fluoride should be distributed throughout the body. It can be prescribed to children with developing teeth because it is best absorbed while the teeth are still developing. This will help children reduce their risk of tooth decay and increase their protection against bacterial attack. It is best for people who have a higher likelihood of developing dental caries. It is effective when it comes to increasing the strength and resistance of teeth against cavities. It is highly suggested for patients undergoing orthodontic treatments. Orthodontic appliances make the teeth more prone to decay and cavities because cleaning is more difficult. You can increase your teeth’s protection by having a fluoride treatment. Fluoride enhances the resistance of the teeth against bacteria, plaque, as well as acid attacks. To know more about this treatment, please call our office at (904) 645-9555.